The automotive industry is male-dominated but more and more ladies are getting involved. They are set to break through the stereotype. We ran into a couple of female students who are studying automotive subjects at the TOC Automotive College (TOC). We decided to interview them about their desires, inspiration, challenges and expectations from studying such courses. It is beyond doubt that the automotive industry is male-dominated, probably to the point of being chauvinistic. More often than not, ladies are delegated to non-technical roles. However, there are ladies who love cars and bikes just as much, if not more, than guys. First up, Ms. Siti Kamilia Alisa Binti Kamarudzaman, who is currently studying for her Diploma in Automotive Technology course. Bikes Republic (BR): What your reason in studying automotive subjects? Siti Kamilia Alisa (SKA): When I was little, I used to help my Dad fix cars. It was his hobby, I guess. We didn’t own a workshop, (so) we only did simple (and) basic stuff like replacing the timing belt and all that. My siblings are all girls but I’m the closest to my father and he’d always ask me to help out. The passion (for cars) developed from there. BR: What made you choose TOC? SKA: A friend of mine studied here and introduced it. He said the system here is different from other universities. BR: What do you think of TOC, so far? SKA: Everything’s great, everything’s good. Classes are good, the practical (sessions) are good; it’s a lot of fun. 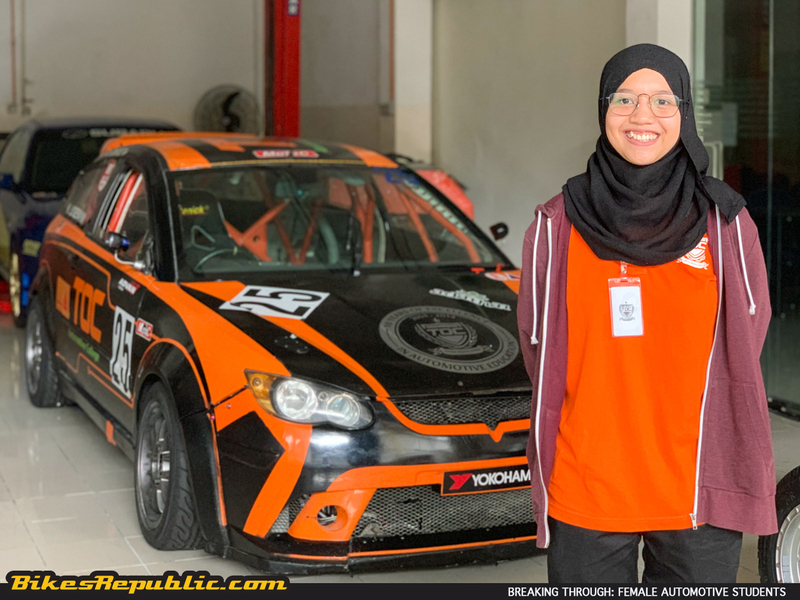 BR: The automotive scene in Malaysia is dominated by men, so what’s your experience in surround by a majority of male students? SKA: People here are okay with it, impressed even, in some cases. I haven’t gotten any backlash or negativity, so far. BR: What are your expectations when you graduate? SKA: Learning new things, for sure. It’s a once-in-a-lifetime experience, I think. I’m just living the moment now and see what comes about in the future. Ms. Nurul Hazirah Binti Musa, Master Technician Course. Bikes Republic (BR): What stoked your interest in automotive? Nurul Hazirah (NH): My Dad and Brother love technical stuff, so I was influenced by them. They’d usually repair cars, bikes or the house. BR: Why did you choose TOC over other technical colleges? NH: It because there’s lots of practical lessons compared to just studying theories. It means there are fewer assignments. Additionally, the facilities here are more comprehensive compared to other places. Also, the quality of the lecturers is very good as they have experience. BR: What’s your opinion about ladies studying technical subjects, given the male-dominated industry? NH: Personally, there’s nothing to it because it’s already ingrained in me. Yes, there were who questioned me about studying to be a (certified) technician. But there’s no distinction between what industry is male or female dominated these days. BR: You’ve done your internship. What did you experience? NH: The only problem I came across was on the strength factor. We can do it but just need a little bit of help once a while. BR: Looking forward, what do you want to do? NH: I’d like to start my own workshop. BR: Do you see an advantage since you’ve studied automotive before starting your business? NH: It is advantageous. For example, I can spot the mistakes made by technicians easier. Training him and correcting his mistake will be good for all parties. In the short term, at least I won’t get cheated by workshops when I send in my car! There you have it. Given the right lead, ladies can develop a love for cars and bikes, instead of the stereotypical Barbie dolls or a Shiseido make-up kit. However, passion can only go so far if one does not seek formal training to walk on the right path. If you are parent reading this, it is okay if your daughter loves cars and bikes. There is always a need for certified technicians, and they can command higher salaries. These students should also find it easy to move up the corporate ladder, or, like Nurul Hazirah, become her own business owner. So, send in your daughters. TOC will take good care of them. Next articleLearn to understand your bike and how to be a better biker!